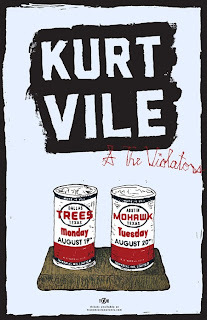 Kurt Vile plays the Mohawk tomorrow night and I want you to see him perform with the Violators for free. Tickets for this show are $18 and they're on the verge of being sold-out. All you have to do to enter for a chance to win a pair of tickets from Austin Bloggy Limits is to e-mail contest@austinbloggylimits.com with "Kurt Vile" in the Subject and your name in the body of the e-mail. If you think you can afford the ticket for Tuesday night's show I recommend you just buy one now though. 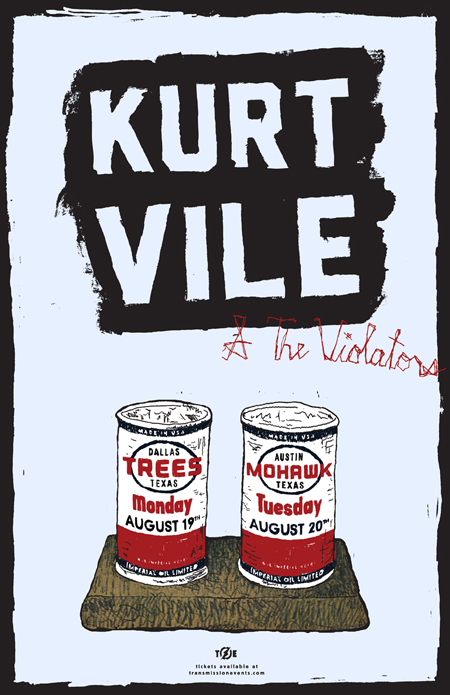 Sure, winning contests is great but Kurt Vile and the Violators is one of the best touring indie-rock bands today and you don't won't to roll the dice and risk missing this show. I was never a big fan of Kurt Vile's records but I have always enjoyed watching him perform. However, his latest release, Wakin on a Pretty Daze truly made me a fan. I don't know what I wasn't hearing in his music up to this point but something about this new record really clicked with me. I feel like it is his most immediate material. It doesn't take a lot of patience to get to the melodies and there isn't a sea of noise to wade through before you get to the good parts. My personal favorite track on the record is called Shame Chamber. It's not a single but it could be. Tuesday night's show takes place on the Mohawk's outside stage, which means things will start and end pretty early. Doors for this event open at 6:30p so don't dilly-dally. Especially if you want to catch support act, Sonny and the Sunsets.